Formal agreements for plans to build a new railway line in East Africa with Chinese help have been signed in the Kenyan capital, Nairobi. It is to run from Mombasa to Nairobi and will extend eventually to Uganda, Rwanda, Burundi and South Sudan. In Kenya, the line is to replace a narrow-gauge track built more than 100 years ago during British colonial rule. China is to finance 90% of the first stage, put at $3.8bn (￡2.3bn), with work carried out by a Chinese firm. Construction work on the standard gauge line is expected to start in October this year, and the 610km (380-mile) stretch from the coast to Nairobi is due to be finished in early 2018. 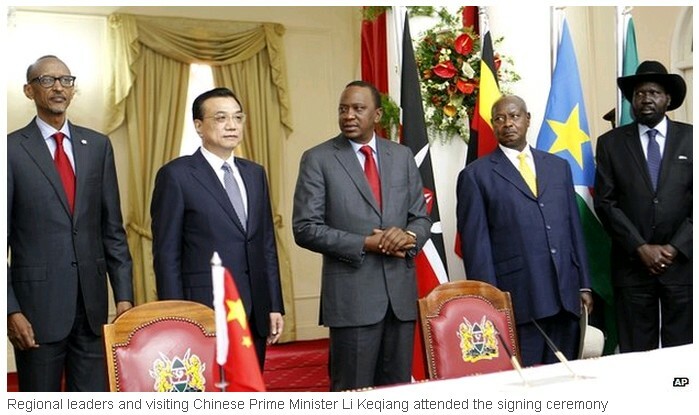 "The costs of moving our people and our goods... across our borders will fall sharply," Kenyan President Uhuru Kenyatta told a news conference after the signing also attended by the leaders of China, Uganda, Rwanda and South Sudan and representatives from Tanzania, Burundi and the African Development Bank. In November last year, Mr Kenyatta laid the foundation stone in Mombasa for the first phase of the project. He had said the new link should cut the cost of sending a tonne of freight one kilometre from 20 US cents to eight, Reuters news agency reported. Passenger trains will travel at a top speed of 120km/h (75 mph), while freight trains will have a maximum speed of 80km/h. "This project demonstrates that there is equal co-operation and mutual benefit between China and the East African countries, and the railway is a very important part of transport infrastructure development," said Chinese Prime Minister Li Keqiang. A subsidiary of China Communications Construction Co has been named as the main contractor. According to the terms of the agreement, China's Eximbank is to provide 90% of the cost of the first phase of the line, with Kenya putting up the remaining 10%. After that stage is complete, it is planned that work on the links to other countries in the region will start. Construction of the original line began in Mombasa 1895 and the railway reached Nairobi in 1899. It reached the shore of Lake Victoria in December 1901. During the difficult and often dangerous work, at least 2,000 workers lost their lives - many of them Indian labourers imported to East Africa to build the railway. Malaria, dysentery and other diseases took their toll as well as accidents and wild animals.